Hide or Die, a unique spin on the asymmetric multiplayer horror genre, has been fully backed in just nine days on Kickstarter. Here’s the pitch: 16 players get dropped into a procedurally-generated level, one player finds an item that transforms them into a supernatural murderbeast, fun ensues. Comparisons to battle royale games are going to be inevitable, but Hide or Die seems to be drawing more from Twitch workhorse Dead by Daylight, but is also adding its own sense of scale and some fresh mechanics to the basic concept. As with Dead by Daylight, the non-killer players have to get several generators running while being stalked by the monster. If they can get all the generators going, the round ends and the killer is turned back into a normal character. At that point, everyone still standing can either leave the match and collect their rewards, or continue on for the chance at more, with a new hunter picking up the chainsaw – er, torch. If you prefer to be spooked by yourself, have a look at our list of the best horror games on PC. 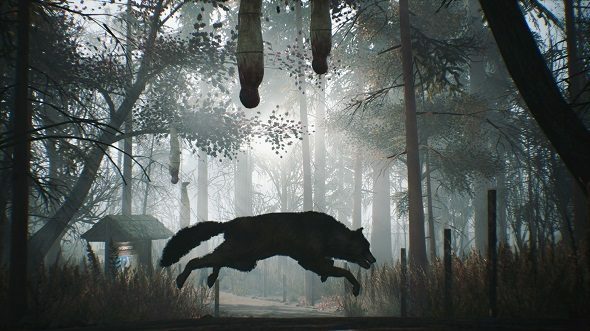 Developer VecFour Digital hit their modest Kickstarter goal of just over $54,000 USD pretty quickly, and told me it’s discussing adding stretch goals, such as new hunters, outfits, and dedicated servers. There’s an extensive gameplay trailer ready to watch, which shows off some of Hide or Die’s spooky environments, which transition from an underground bunker to some docks and eventually to a park that looks quite a bit like Camp Crystal Lake. Screenshots also show a suburban cul-de-sac and an upsettingly realistic forest graveyard. There are PvE elements planned too, such as hostile wildlife – just in case hiding from a deranged knife-wielding mutant isn’t tense enough for you. According to the Kickstarter, Hide or Die will be available in beta this August, with the full version tentatively slated for October.